Cozy basement apartment 5 blocks from U of O! Great neighborhood! 1 bedroom, + futon in living room. Full kitchen and bathroom. Close to campus! Our apartment is located below our home and is close to the U of O campus, athletic events, coffee shops, dessert shops, and parks. Hit the nearby running/biking/hiking trails for some exercise and relaxation in nature. Take a day adventure to visit the ocean, ski the mountains, and hike along our beautiful rivers. Our 1 bedroom apartment sleeps up to 3 with a queen size bed in the bedroom and a full size IKEA futon couch in the living room. We have a fully stocked kitchen which includes a stove, fridge, dishwasher, and of course a coffee pot with coffee and half-and-half waiting. For the little travelers, we have a port-a-crib available as well as an assortment of books and toys. We rent the upstairs house to five respectful, responsible college students. You will likely hear footsteps on the wood floor upstairs, as well as voices and normal living sounds. If you have questions/concerns during your stay, please message us through the VRBO App. We are happy to help, and we want to respect the privacy of our tenants upstairs. We may be able to accommodate an earlier check in time, depending on our availability to have the space clean and ready. This will depend on when the last guests checked out and our work schedules. Weekends will be much easier for us to adjust check-in to earlier in the day. Basic cable and wifi is available. Because it's a basement apartment, sometimes guests will have to find spots in the apartment that have cell reception - depending on your carrier. We are happy family who loves to laugh and play games, to hike and explore. We love our pets and being in nature. Dave is an elementary school principal, and Amy is a mental health therapist. 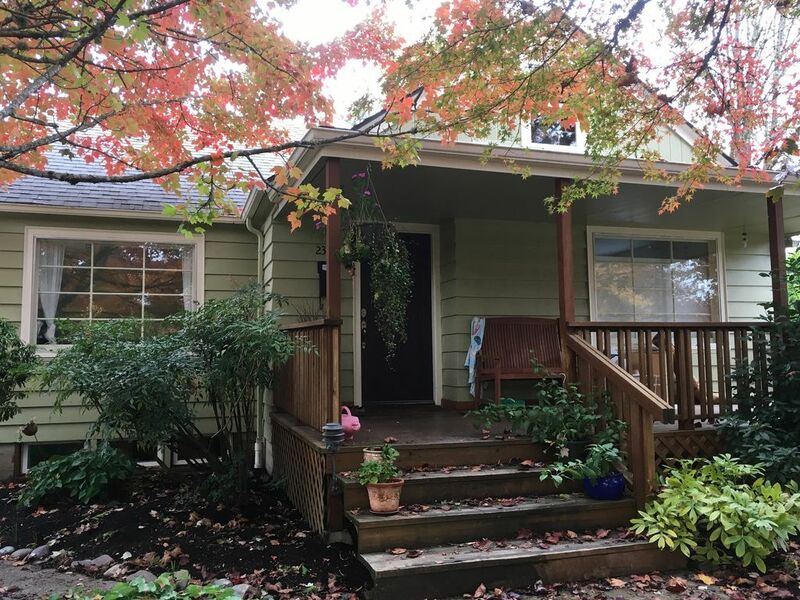 Our basement apartment is a cool, fun space, a perfect getway for a couple, a family, or a few friends in Eugene for a Duck game or an adventure. A spacious living/dining room, a nice kitchen, a cute bathroom, and a cozy bedroom make the space work for up to three people. If you are traveling with a child, we have a port-a-crib, toys, and games that will help you make yourself at home. We are happy to either help you orient to Eugene or leave you on your own. Either way, you will have plenty to do in Eugene and the vicinity! toilet, combination tub/shower, Cute, colorful bathroom. Forced air electric heaters in each room. You will need to park in the street, but we supply parking passes so the parking is free. With futon that folds into a comfortable full bed. Glass top stove, 4 burners. With organic, fair trade coffee grounds and half-and-half! Full kitchen stocked with pots, pans, utensils, plates, etc. Dining table and chairs are on one end of the living room. The tenants are very nice and personable. The complimentary half & half already in the refrigerator was really nice! Just couldn't find any sugar haha. It is a very spacious and cute place. The people above can be a little noisy on the weekends. I would stay here again. Our family really appreciated the proximity to the University, grocery store and restaurants. The apartment was clean and accommodating with everything we needed. However, the tenant upstairs played loud music until late, yelling and carrying on until well after midnight both Friday and Saturday. We could have accepted this (as it is a college town) except we needed to be at our event at 7am each day with our daughter ready to play 5 hours of high intensity volleyball. Communicating with either us or the tenants could have helped with the expectations of the accommodations. Still, way better than a hotel. In a nice neighborhood in biking or walking distance to everything we wanted to do. Comfy bed, nice linens, quiet, and clean. You can't go wrong! This place is the least "basementy" basement apartment we've ever stayed in. Bright, warm, clean and spacious. My son, my mom and I spent two nights at Dave's place while exploring the University of Oregon campus and the city of Eugene. Location was perfect -- walkable to campus, plenty of street parking and in a quiet neighborhood. Hearing a few footsteps from the well-behaved college kids living on the main level just added to the charm and college-town vibe. If our son becomes an Oregon Duck, we will most certainly stay here again! The apartment was very easy to access and conveniently located, the kitchen well-appointed, and bed comfortable. There was tea and coffee (including organic half & half in the fridge!) for the morning and the wi-fi worked just fine. The cable was basic - very basic. If you don't care about TV, then not a problem! We were just disappointed to not be able to watch the Ducks football game while actually in Eugene. I would recommend staying - a good place for a great price. Great location and nice owners. The unit is spacious for two people. The kitchen is well stocked and big. Welcome to the home of the Oregon Ducks and a gateway to many adventures! Eugene is a college town with the many benefits that come with that distinction: athletic competition, speaking events, and academic exploration. Also, within an hour of town, you would be able to walk on a beautiful beach, hike along the stunning Mckenzie and Willamette Rivers, or explore a breathtaking forest.